Don't you just love autumn? It's my favourite time of year. Some people crave the heat of summer but I'm all about big jumpers, slippers and my woolly hat. There's so much to love about autumn but it always seems to go by in a flash. One minute you're crunching leaves, the next you're in the freezing depths of winter. So I thought I would make myself a checklist of all the wonderful things I want to do this autumn, so I can really appreciate all the little things I love about the season. Jumping in leaves is my favourite thing to do during the autumn months, especially when they're crunchy (yes, I am a big kid) so it had to be at the very top of my checklist (the others are not in order of preference because I simply couldn't choose between them). I've had a head start on the blanket as I've been working away at it for quite a while now (I'm a newbie at crocheting and still learning the basics!) and I've already bought some wool in gorgeous autumny colours for the scarf, so I'm itching to getting started on that. If you follow me on Instagram, I'm sure you'll get a glimpse at the woks in progress! I'm already starting to get the autumn feels just from making my list, so I'm looking forward to getting stuck in! 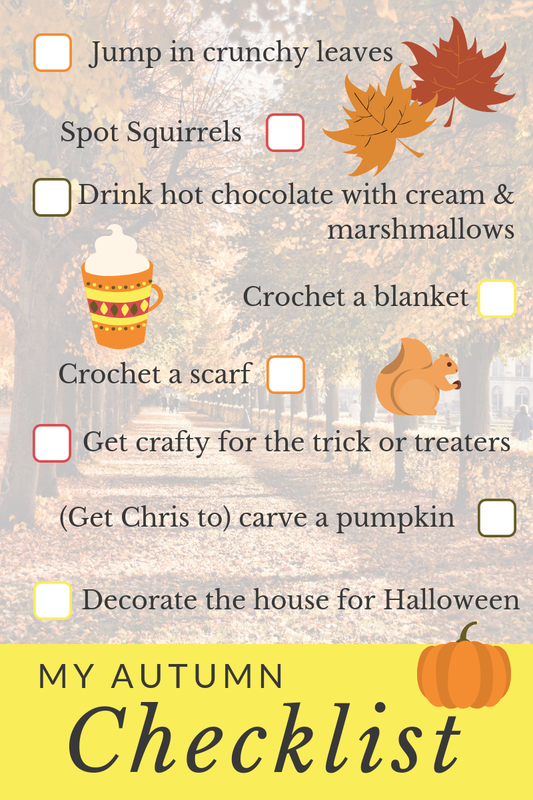 What would be on your autumn checklist?